BioLogic® New Zealand Maximum Forage. Produces up to 10 tons of Forage per acre. 38% crude protein. 80% digestible. BioLogic® New Zealand Maximum is the absolute best annual forage available to hunters and land managers. BioLogic's Maximum contains 100% New Zealand brassicas that can be planted in either the spring or the fall. This team of brassicas is the ultimate in attractiveness and nutrition for whitetails, yielding as much as 10 tons of forage per acre. This blend has been proven by universities to yield over 38% crude protein with over 80% of the protein and other nutrients being digestible. The plant species in this blend mature at different rates to ensure that highly palatable forage is available during the entire life of the plot. The forage species in this Blend grow in a wide variety of soil conditions. BioLogic's New Zealand Maximum will concentrate the feeding habits of the deer on your property, enhancing hunting, wildlife viewing and even more important, tightening the core area of your deer herd. How to Plant: This Blend is best planted by spreading the seed on a well-prepared seedbed at 9 lbs. per acre, and then using a cultipacker to cover the seed. Broadcasting the seed on a well-prepared seedbed just prior to a rain also produces an excellent stand as the rain serves to bury the seed the appropriate depth (1/ 4 ") and ensure there is adequate soil moisture for germination. Maximum can be used to top-dress existing stands of Premium Perennial and Clover Plus, adding several tons of nutritious forage during the fall. When to Plant: Maximum is very hardy and will germinate in drier conditions than other common fall food plot crops. However, there must be some soil moisture available. Soil moisture is certainly more critical than temperature. The Crop should ideally be planted a minimum of 30 days before the first frost date, in any of the planting zones. 27 lbs. = 3 acres. 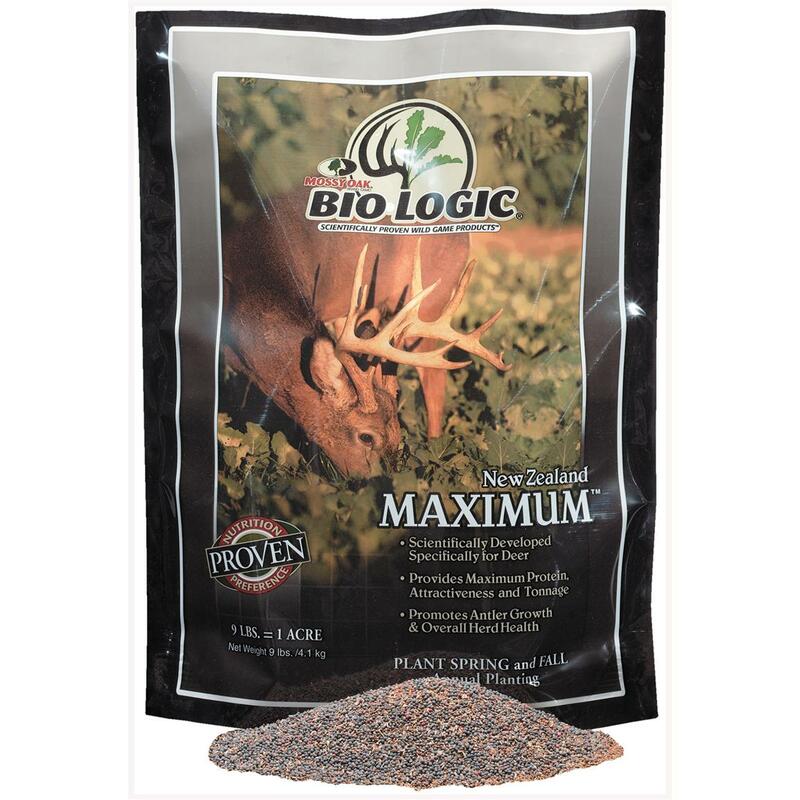 NOTHING attracts whitetail and provides as much nutrition as BioLogic's New Zealand Maximum. Get yours ONLINE today! 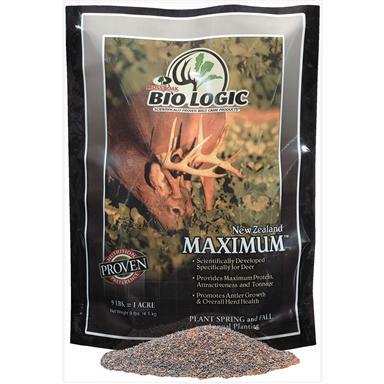 BioLogic New Zealand Maximum Forage, 27-lb. Bag is rated 5.0 out of 5 by 2. Rated 5 out of 5 by STEPHAN from Shipped quickly, best price we've found for the product.